For someone moving to the United States for a chance at a better life, navigating the process of finding a job can be difficult and intimidating. Obstacles to finding employment can include language barriers, limited resources and lack of skills and experience needed to find suitable employment. When Adeline moved to the U.S. from West Africa in 2004 for an opportunity to pursue the American Dream, she found herself in this exact situation. She did not speak a word of English, had never been employed, had never used a computer, and did not know anyone. In her first few years in the U.S., Adeline gave birth to two children. Financially unstable and with no family nearby, she made the difficult decision to move her two young sons back to West Africa to live with her mother while she stayed in the U.S. to try to make a life for herself. Though this decision was the most difficult one Adeline ever had to make, it proved to be her driving force. In 2008, a friend told Adeline about Goodwill. 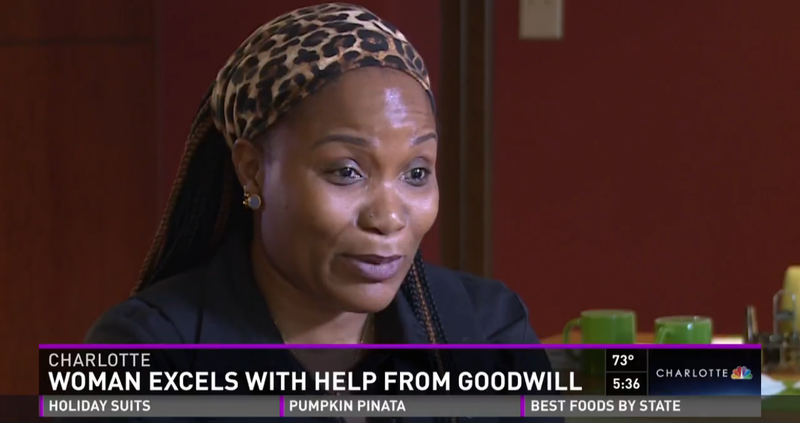 She came to Goodwill’s Career Development Center on Freedom Drive and enrolled in the hospitality & tourism occupational skills training course. During the seven-week course, Adeline gained an understanding of the hospitality and tourism industry, learned basic computer skills, built her resume, learned valuable job-search skills, and gained confidence through interview preparation. Towards the end of the skills training program, Adeline and her classmates attended a job fair at a nearby hotel. From that job fair, Adeline was hired to work at the Renaissance Charlotte SouthPark Hotel. In fact, she was unable to attend her graduation ceremony because it was her first day at her new job. Seven years later, Adeline is still employed with the Renaissance Charlotte SouthPark Hotel. She has worked her way up from bussing tables to being a full-time server, lead trainer and bartender for the hotel’s restaurant and banquet halls. Since being hired, Adeline has learned how to establish credit, bought a car, bought her own house, and in 2011, she moved her two sons and her mother back to the U.S. to live with her. Adeline is proud of her accomplishments and grateful to Goodwill for giving her the opportunity for a better life. Adeline’s advice for anyone facing a difficult situation? Want to hear more about Adeline’s courageous, emotional journey to family sustaining employment? Watch her recent success story with NBC Charlotte’s Sonja Gantt as part of the annual “Make a Difference Day” here.